All across the country, people are out in the streets protesting, waving signs that say “Black Lives Matter,” in response the the killing of unarmed black men by police. In Philadelphia, we will march and “Reclaim MLK Day” on Monday, Jan 19 starting at 2 pm at 44 N. Broad St and over to Independence Hall at around 3:30. During this upheaval, I have seen friends and relatives on Facebook questioning “why” people are protesting. Most of the time, people share the sense of injustice with the protesters, but often they question the method. Often, people point out how few people were voting in Ferguson before Michael Brown was shot (despite the fact that in other parts of the country in which voting rates are higher, we see the same murders and lack of police accountability). I have some insight since my profession is to incite (move people into action). On or around January 19th, Martin Luther King Day, we will take to the streets in protest to Reclaim MLK Day. On that day, hundreds of thousands of well-meaning people gather at churches, school and parks and do good stuff, like feed the hungry, clothe the poor, clean up the neighborhood and repaint football uprights (that is what I was asked to do one year when I was the Student Body Service Coordinator of Mesa Community College). There is nothing wrong with those actions. However, we (Reclaim MLK people) contend that these actions don’t actually speak to the legacy of Dr. Reverend Martin Luther King Jr.
Reverend King was not known for feeding the poor. He was known for demanding the right to vote, desegregating the bus system in Montgomery and for confronting powerful people to change society in a permanent way. 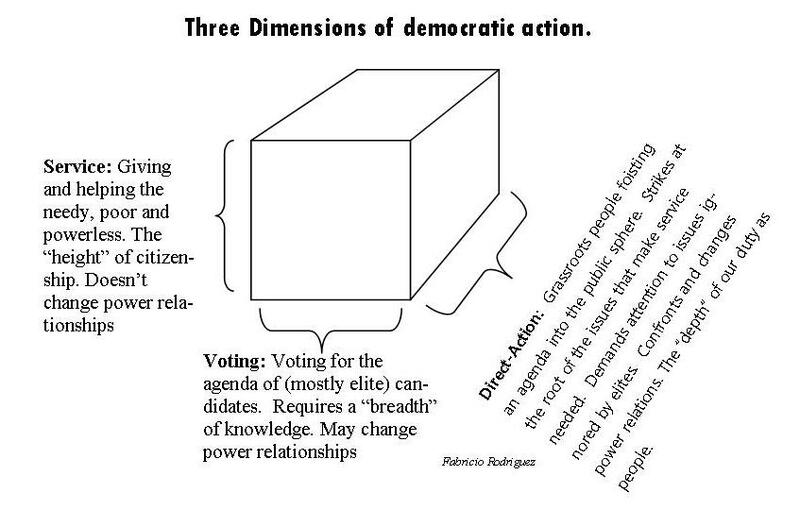 “Direct-Action” is a little spoken of dimension of our democracy (If you are saying, “we can’t be a democracy as long as racism exists.” I concede your point, but work with me to get through this explanation about how direct-action seeks to build the democracy we claim to be). In our democracy, there are a few ways to make social change. Traditionally, on MLK Day, we volunteer. Volunteering to address the immediate needs of people, such as feeding the hungry, addresses the problem for a little while. But, unfortunately, when we return to our lives, those people will likely be hungry once again. Direct-service, does not address the root cause of hunger but address a real, short-term, material need or problem. In my diagram, I call direct-service, the “height” of our citizenship (I use “citizenship” for the lack of a better word. I know many non-citizens and undocumented immigrants are involved in all of these methods). Another method of social change is voting. I call voting the “breadth” of our citizenship because it requires a lot of research and diligence to make a good choice in the voting booth. Voting lacks much, however. Take a look at our Congress. Those in office are almost universally white, male and wealthy. Can we really hope that they will make the needs of the powerless a high priority? How do their lives as mostly white, male millionaires give them any understanding of the needs of regular, much less, extremely marginalized communities? When you vote for them, you are voting for their values and agenda, not necessarily your agenda or that of your community. 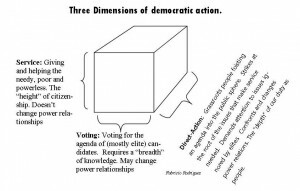 Direct-Action, the sacred, third dimension of our (world?) citizenship has always been essential to making progress for regular and marginalized people in our nation. Direct-Action, often recognized by non-agitators by the “street protest,” is a powerful tool. 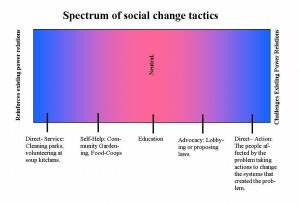 Direct-Action, is social change created BY the people affected by the problem. These people are calling the shots and they confront the powerful to permanently change their relationship with the powerful people. When they gain some power, they enact changes that have a direct and material change for those people (think: “the right to vote” or “higher wages”). Direct-action is how we reset the agenda. We demand that the issues that would never be considered by our government or by an employer or by the police or by anyone who has power over us, be taken seriously. Why? Because, suddenly, they see that we (There are so many of them out there chanting! And…oh god! Giant puppets!) are a threat to their power. Though I have never heard of Dr. King filling soup bowls, I don’t doubt that he did. I assume he voted (I could find no definitive evidence). 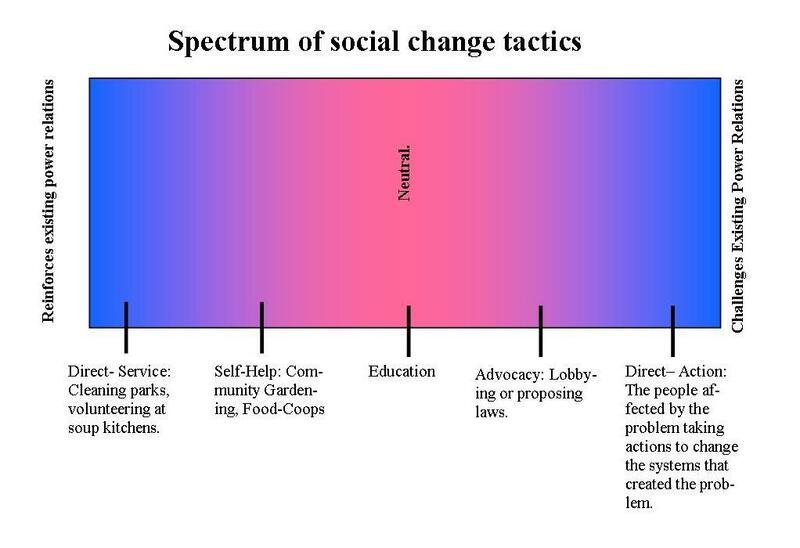 However, as a “practitioner-of-social-change” I believe that he did both of those things, as they are 1. good and 2. serve as tools to move people toward that sacred, third dimension, which is direct-action. We need all three modes, but what we (Reclaim MLK Day people) are saying, (as would Reverend King) is that we need a lot more of that confronting-power-type-of-action going on! As an example, the film, “Selma” is in theaters now. In the trailer, you will see a couple of hallmarks of direct-action. 1. It wasn’t just Dr. King. It was thousands of black people who couldn’t vote who were protesting. This is different than paying a lawyer or lobbyist (usually also wealthy and white) to hob-nob with other powerful politicians for change. Lobbying re-affirms the existing power relations between the wealthy, white and educated vs. the poor, disheveled masses (hiccup). 3. “Peace,” “justice,” “fairness,” “courage,” and “dignity” are transcribed into the DNA of the actions that the protesters took. What did the actions that the brutal, counter-protesters take say about their values? If you could list, side by side, the values of each, which side would you choose? 4. This moral action, agitated the broader community, demanding that those people in Selma, and our nation, make a choice. When you see the die-ins and the protests, what side are you choosing (HINT: “Not taking a side” is actually taking a side…the side of the status quo, the side of those who would rather things stay just as they are). 5. Their demands were considered “too much” by the powerful people in charge. In the clip, President Lyndon B. Johnson says, “This thing is just going to have to wait.” Again, referring to the agenda setting power of direct-action, the movement doesn’t allow those in power to determine what is reasonable nor the time frame. Direct-action is the act of changing the agenda and the time frame…and therefore history. We are reclaiming the legacy of Dr. Reverend Martin Luther King Jr., a legacy of direct-action (both Dr. King and Rosa Parks were trained in the practice of direct-action at the Highlander School. It was here that Mrs. Parks learned the tactic of the “sit-down strike” which she preformed that fateful day on the bus). We demand change. We demand it now. Part of this bias against protesters is because people generally don’t like conflict and look poorly on rebels. But, rebellion is how progress has always been made. In fact, if you believe the bible, we only became human because Eve rebelled against the word of God and ate the forbidden fruit. Before that moment Adam and Eve were in a child-like state, with no free-will. The rebellion actually made us into PEOPLE (as we understand the concept). Rebellion so much a part of being human. It is our birth right. Do protests work? Honestly, sometimes they do, sometimes they don’t. 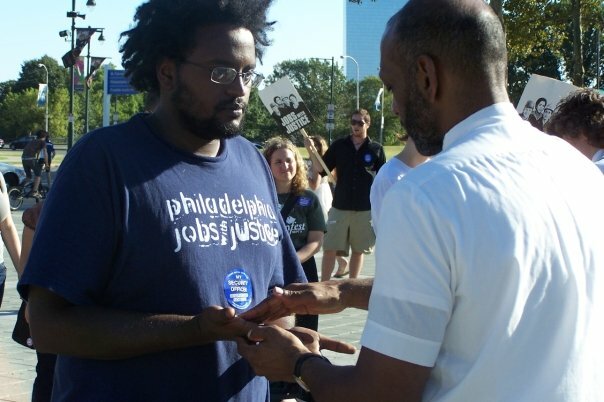 We won (in a previous movement) paid sick days for 180 security officers when we held a “anointing of the hands” ceremony on the steps of the Philadelphia Museum of Art in June 2008. We heard of the victory during the event. That is a rare thing. Making that boast also takes for granted that we held dozens of actions, protests and occupations before that. Did we win it that day? Yes. Because of that single action? No. Did THE protest work? No. Do constant, increasingly militant protests work? YES! So, I would say that 99% of the time a single protest doesn’t change anything. But, only a person who didn’t really want to change things would quit after one protest. It takes many actions, of which public protests are only one option, to win a campaign. It takes a multitude of creative tactics, often including direct-service and voting to win a direct-action campaign (those are not tactics of direct-action, but things we may have to do to get people to the courageous point of taking direct-action). I have always likened it to packing a snowball, a change-maker must apply steady, increasing pressure from all sides of the target to force the powerful person to accept your agenda as one that must be dealt with. That said, do not mistake the work of lawyers and politicians for the work of direct-action. They may be standing there when the agreement is signed, shaking hands in the picture in the newspaper, and they play a critical role, however, they are rarely the people that catalyze the change (many awesome attorneys are a part of movements, integrated and interdependent with the rest of us). Are you ready to make history? Join us, in Philadelphia on January 19th. Excellent. Excellent. EXCELLENT!!! Thank you, I am forwarding this article to lots of folk.